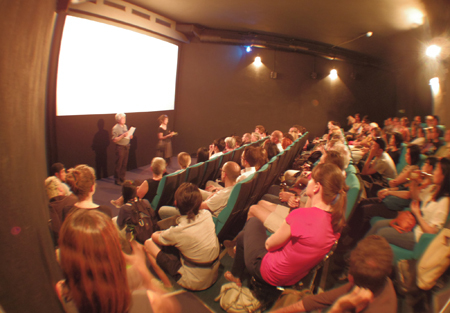 Okinawa Filmabend is a movie screening event that aims to introduce Okinawa to Berliners. This year will be showing "Okinawa –The Afterburn–" (2016/John Junkerman). With our event, we hope to create communication between Okinawa and European countries that reaches across national and regional boundaries. We further hope that Okinawa will inspire people in Berlin. Our goal is to share with Berliners the unique culture and rich nature of Okinawa. Also, the film looks at the issue of the US military in Okinawa. We wish for this event to share the rich and diverse aspects of life in Okinawa with the world. Our previous, Okinawa Filmabend held last year, was a great success. Although our screening of "The Targeted Village" (2012/Chie Mikami) was planned for 80 audiences, we had more than 120 people gathered at the event. The guests responded in our survey commenting "I had no idea that such a problem existed" and "a topic of utmost interests". Our small, non-profit group consists of students in Germany. It is our wish to make the event open and accessible, so we would like to make it with no-admission fee. Your generous support would be used to cover the costs including license fee for the movie screening, venue fee, and other promotional materials such as flyers. All the donors will receive an original Thank You letter and postcards designed in Berlin. We are very grateful for all the support we have received so far, and we sincerely ask for your support to help us achieve our goal. We thank for all of your help in making this event possible!